One of the class blogs he is most happy with is the one for his Yr11 Level 1 Science class. When we sat down together to talk about his classroom blogs, Mr Nicoll made the pleasant realisation that the last few entries had been made by his students who were creating collaborative study notes from the lessons. This is a tremendous example of self-directed learning by the students and he partly attributes it to their increased engagement through the use of technology. Similar to his explanation with Yr12 students, Mr Nicoll explains that less time copying some of this information, combined with making it freely available “anytime, anywhere” means his students spent more time conducting hands on science experiments. The class blog lets me scaffold and differentiate my lessons better because both the students and I know that the key material is available to them on the blog. 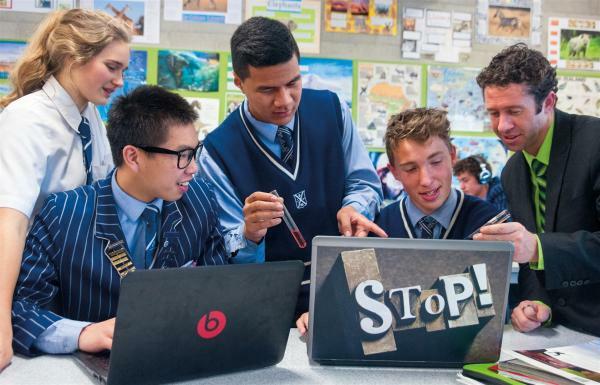 In saying this, Mr Nicoll is realistic about Yr9 students and the need to maintain effective classroom management – it’s not simply sitting at his laptop blogging all lesson! I might start the upload of the video from the key teaching moment and then roam the class providing assistance to students. I often come across students accessing the video recorded earlier that lesson to review a point they may have missed or not fully understood the first time. This entry was posted in eLearning, Science, SOLO and tagged blog, Education, Flipping the Classroom, Moodle, Science, SOLO, Student, Student engagement by Sam McNeill. Bookmark the permalink.